Finished the first Core unit of the Empire army - a unit of mounted knights. Since I've yet to receive the Empire Army book, I'm not sure what actual unit they'll be. In fact, I've only attached the shields using tack in case I have to switch them out. For the first time, I've added "flowers" to the bases. These are from Army Painter and weren't too fiddly to apply. The banner design is generic and I might add something to it later. I do like the red and white color scheme of Talabheim; although the city name sounds kind of close to the real world bad guys. Once the General and BSB are done it will be time to work on the four boxes of infantry. Finished the General, BSB and Order Knights. Actually still need to finish the actual banners, but the figures are painted. Of course, the bases still need flocking too - this time I'll try to put more effort into them then I normally do. I notice skulls are prominent on these models. The two models that come in the Empire General kit. The kit comes with several head choices, as well as weapons. I pretty much went with the ones on the cover of the box. Both figures are wielding Great Weapons. I used Vallejo Gun Metal with Silver highlighting for the armor; much easier than the bufferable metal paint I used for the horse armor. The gold is from a 10-year old bottle of Gold Leaf - amazingly the paint was as fresh as it was when I first bought it. The Sigmar and Karl Franz logos are also much in evidence. The BSB's banner is pretty huge - the Grim Reaper with wings spread. The Order Knights are also finished; just have to finish their lances and shields; as well as the unit standard - it's a one-piece part from the guy with the missing right arm. As you can see, they are decked out in Talabheim colors. I plan to add spirals to a couple of the lances. Hoping to get the Empire Army book tomorrow in the mail; I won a copy off of ebay last week. My buddy Pat L. (aka Socal Warhammer) kindly gave me a copy of the Warhammer rulebook - the small one that comes with the Island of Blood set. I read up on the Magic Phase rules and they don't seem too difficult; just need to play them a bit. I'm taking a Level 3 Wizard and will probably focus on Lore of Fire or Lore of Heavens. I look at the Magic Phase as chance to get increased Attacks or Saves. 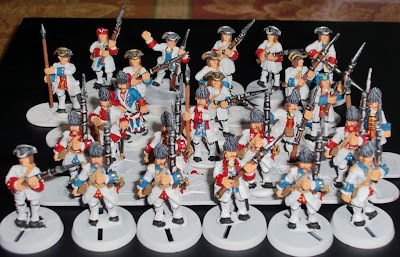 Thanks to my buddy Pat L. (aka Socal Warhammer) who provided me a bunch of GW bases I was able to finish basing the Foundry French SYW Infantry. After a finish of Dullcote, I gave the facings a little bit of highlighting; otherwise I let the Minwax stain do most of the work. 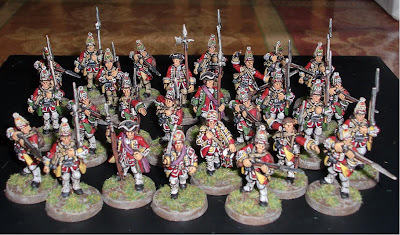 They are Grenadiers and Fusiliers from the La Sarre and La Reine Regiments. They are more lightly equipped than their British counterparts. These French have no backpacks or other field gear. A comparison shot of a Foundry Frenchman and the General Wolfe figure by Front Rank. I was surprised to see these Foundry are actually slightly larger overall than Front Rank. How'd you like to be karate chopped by that French dude! 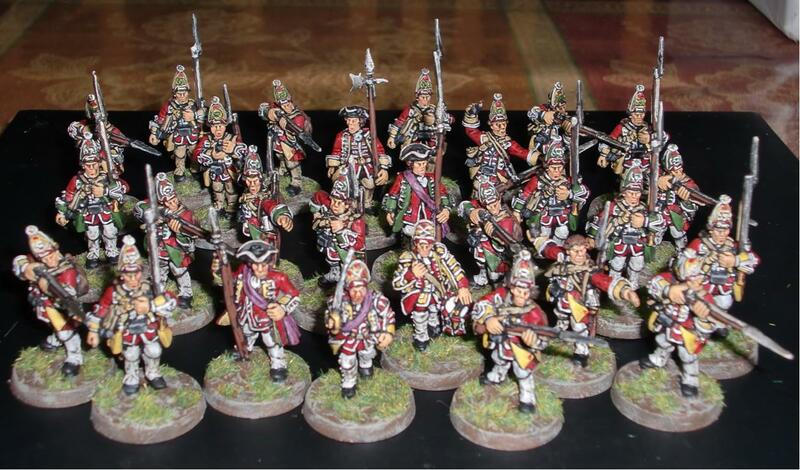 The unpainted Front Rank British Rangers I picked up in Vancouver, B.C. from Doug Ham a few weeks ago. And the Front Rank French Coureur des bois who will be the Irregular counterparts to the Rangers; also picked up from Doug. Both the Rangers and these guys' poses make them look like Irregulars compared to the more static poses of the earlier completed British Grenadiers and the French Infantry. Not sure when I'll paint up the remaining figures, but I finally read through the Muskets and Tomahawks rules and really am looking forward to getting a game in. Finished painting the horses; although I regret spraying the buffed metal armor with clearcoat. The clearcoat darkened the polished armor more than I would've liked. It also seems to have accentuated graininess of the finish. That's the Empire General's mount front and center, rearing. I used the box art as a guide - looks like he's in the colors for Talabheim. I will paint the knights with Vallejo acrylics - so much for the experiment using bufferable metal paints; just not worth the effort. I'm sure once the knights are mounted and ranked up, the flaws in the armor will be minimized. 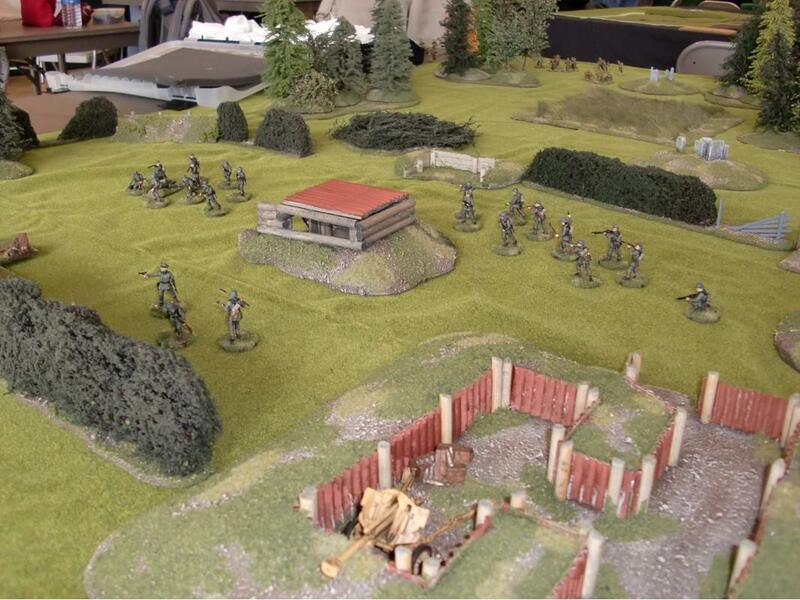 Met Old Bob at the Game Matrix for a Bolt Action refresher game today. 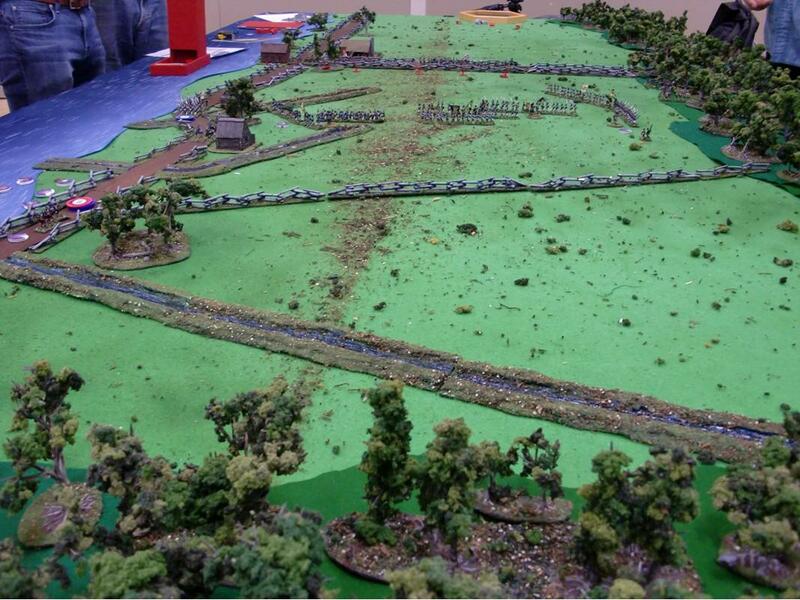 He brought his 1,000 point Japanese army with Chi Ha tank, mortar, artillery, sniper and MMG support units. My Fallshirmjaegers had a Panzer IV, MMG, panzerschreck and SdKfz 234/1 recon vehicle as support units. We played about 8 turns with my Fallshirmjaegers decimating the Japanese, but failing to obtain any of the three objectives for the Point Defence scenario we played. Early in the game, a lucky hit from the Chi Ha immobilized the Panzer IV - basically turning it into a very effective pillbox! Other than the lucky hit and damage to my Panzer IV, the Japanese marksmanship was not up to par. Even when they did hit, the Fallshirmjaeger Veterans were hard to wound. In fact, a Fanatical charge made by one Japanese squad ended in disaster for them. The fairly inexpensive SdKfz 234/1 proved to be a very good support vehicle. Not only can it use its special Recce maneuver as a reaction to fire, but it's 20mm light auto-cannon and co-axial MMG make it a great offensive weapon too. In fact, it took out the enemy's MMG team at long range. It also has a 7+ Damage Value which makes it immune to small arms fire, other than taking Pins. It was good to see Old Bob, who drives all the up from Oregon to game with us sometimes. My buddy Pat, who dropped in to drop off some more WHFB stuff for me, said we may reciprocate and visit Bob next weekend. The Game Matrix itself was fairly crowded today with a 40K tournament taking most of the tables and Mark Waddington hosting a large play test for his Vietnam game he will run at Enfilade! next month. 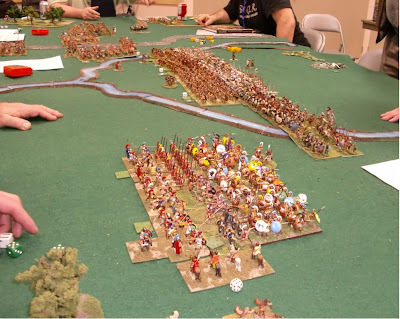 Here's a picture of Mark's game - he had over 10 players. 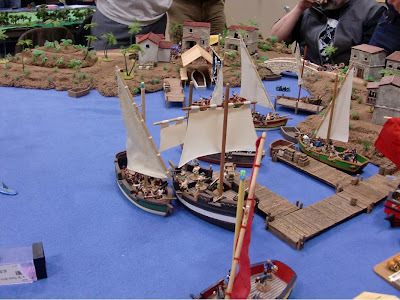 Mark always puts on spectacular games with his excellently painted figures and handmade terrain. I tried to remember how to use them as the tutorial website I had bookmarked years ago was no longer up. From what I recalled I had to use a black undercoat and then brush on a coat of the paint. After the paint dried - within minutes - I took Q-tip cotton swabs and gently buffed the finish to a shine. I used the darker color, Iron, at first, but it look too dark so later went over it with the lighter Chrome. It would've been best to use Stainless, but that bottle had dried up. As buffing is required to get the proper finish, it is best to do this first and then paint the rest of the model. The rearing horse is actually from the Empire General set - I used just Chrome on that one for a brighter armor. The two larger figures pictured below were painted the same way and the finish has remained unchanged for over 10 years, but I think I'll clear coat these wargaming figure as they'll be handled more. I'll work on the knights' armor next - I think they'll be a bit more fiddly as the armored areas are a lot smaller. Got the Empire General and Battle Standard in the mail yesterday; today a box of Order Knights. Went ahead and glued most of the parts together. Lots of spare parts from both kits. Will paint them up as Talabheim - as I like the red and white color combination. In anticipation of starting on a Warhammer Fantasy Empire army, I managed to block paint and stain the French figures for Muskets and Tomahawks. 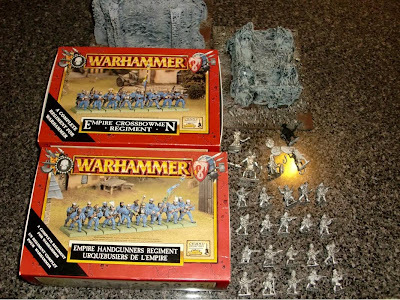 These are all Foundry figures that were picked up last month when my buddy Pat L. (aka Socal Warhammer) and I attended the WAB GT and then stopped into the Wargames Foundry in Nottingham. They consist of a pack each of Grenadiers and Grenadier Command, and two packs of Piquet Party. Here they are after being stained with Minwax Tudor Satin polyurethane. The ones with blue facings and red waistcoats, as well as the drummer, are from the La Sarre Regiment. The ones with red facings and blue waistcoats are from the La Reine Regiment. Both units saw extensive service in the French and Indian War. However, the La Reine Regiment was not present at the Battle of the Plains of Abraham- which most of the other French units were at. At the time the La Reine Regiment was sent as part of a blocking force at Lake Champlain. Here are the figures after a block paint job, prior to the stain. The gris blanc uniform being pretty close to white really sped up the process - especially after using white spray paint as the undercoat. 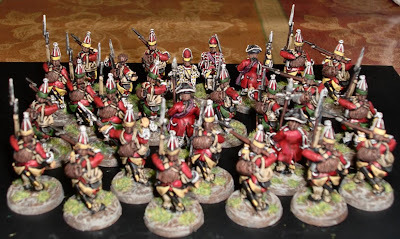 Again, as with the earlier British Grenadiers, I'll wait a few days to allow the Minwax to thoroughly dry before spraying them with Testors Dullcote. Finally got around to flocking their bases - as well as giving them a finish of Dullcote. Added a little rouge to their cheeks too; as they are somewhat sculpted caricature-style with large cheekbones. Figured, might as well go all the way. Anyway, here they are en masse representing the Grenadier companies of the 22nd, 40th and 45th Foot. General Wolfe formed this ad hoc unit in 1759 at Fortress Louisbourg in Nova Scotia - hence the name. They actively campaigned in the French and Indian War - including the Battle of the Plains of Abraham - also known as the Battle of Quebec. 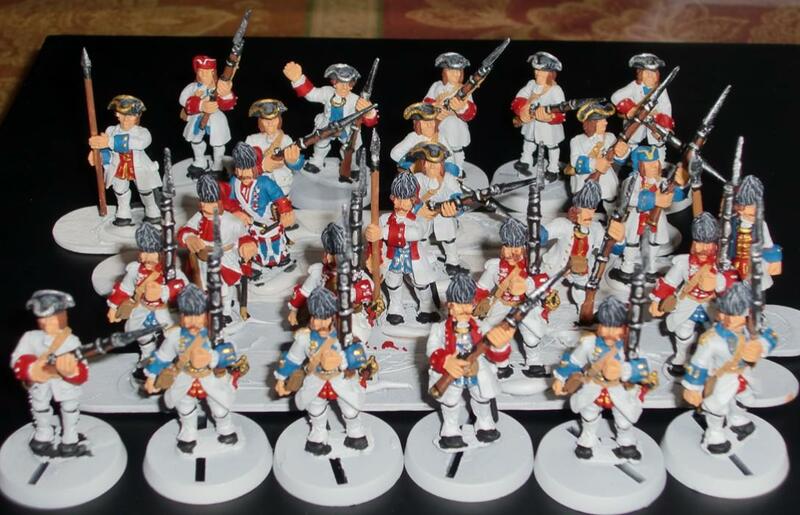 These are all Foundry figures from their Seven Years War Range. I've read mixed reviews of them on TMP, but actually like their robust, and exaggerated, sculpting. 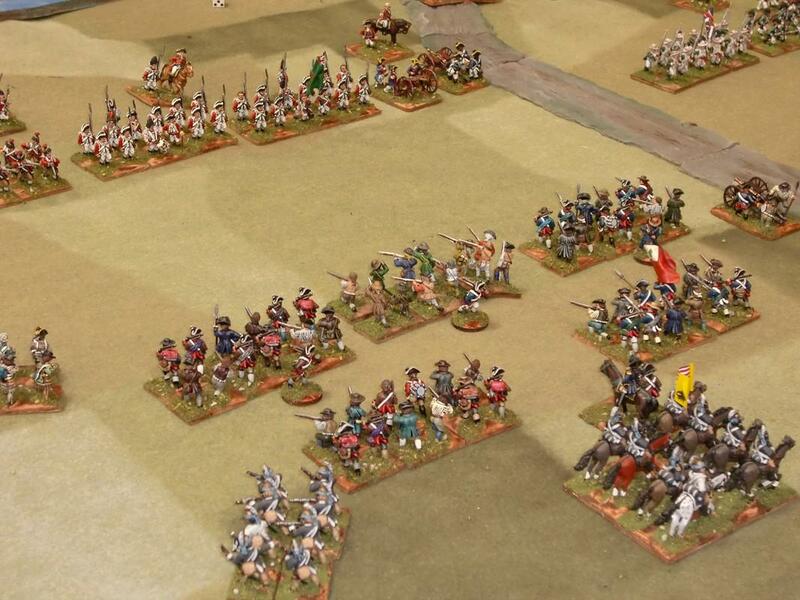 They are definitely on the larger side of 28mm - which is what I like for skirmish games anyway. 22th Foot - the officer has a face that reminds me of a fish - his nose is flattened. Not sure if this was from the packaging or if sculpted that way. I painted some shadowing to accentuate his nose a bit. 40th Foot - these have buff colored leggings. 45th Foot - the green facings are a nice contrast to the red - reminds me of Christmas. The green facings could probably use some highlighting, but the Empire calls. Rear view - showing the campaign gear and backs of the mitre caps. 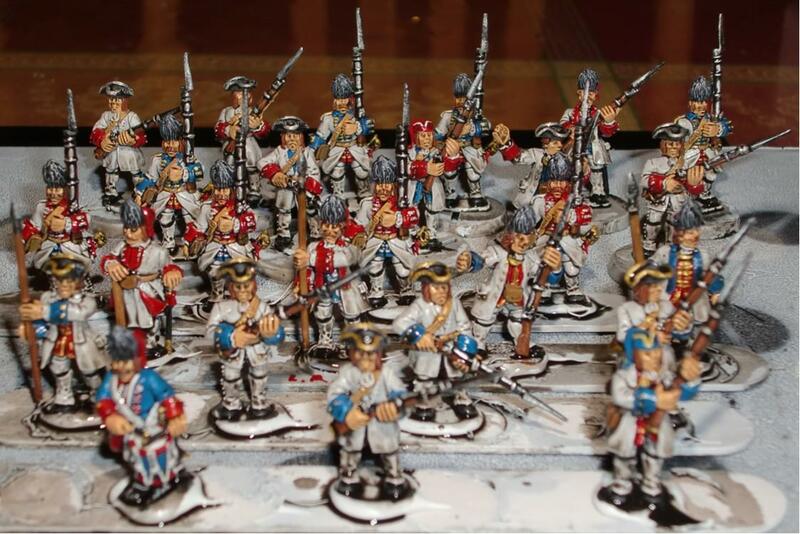 I need to work on their French counterparts - which I believe should be easier with their mostly white uniforms. I read, also on TMP, that their coats and pants were more of a white than light grey color. My plan is to spray paint them white and add some block colors for cuffs, etc. and then a stain of Minwax. 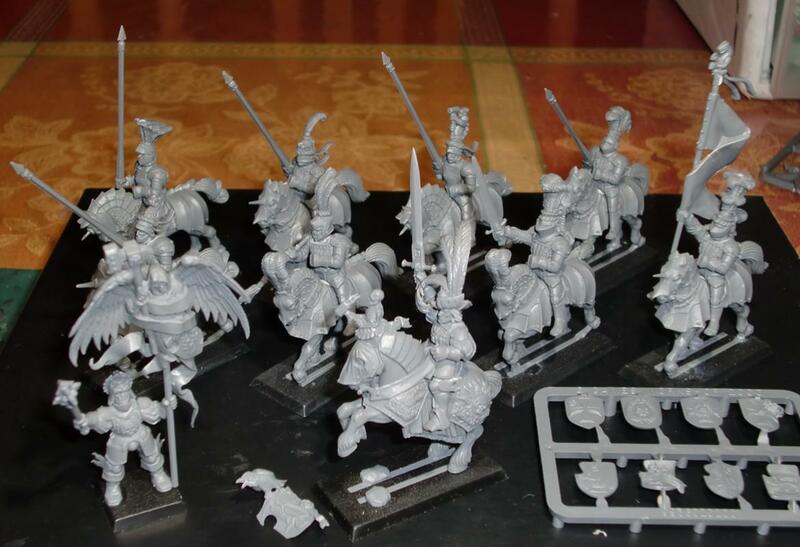 After they are done, I will focus on building a Warhammer Fantasy Empire army. I've picked up some stuff off of ebay, like an Empire General and also a box of Order Knights. 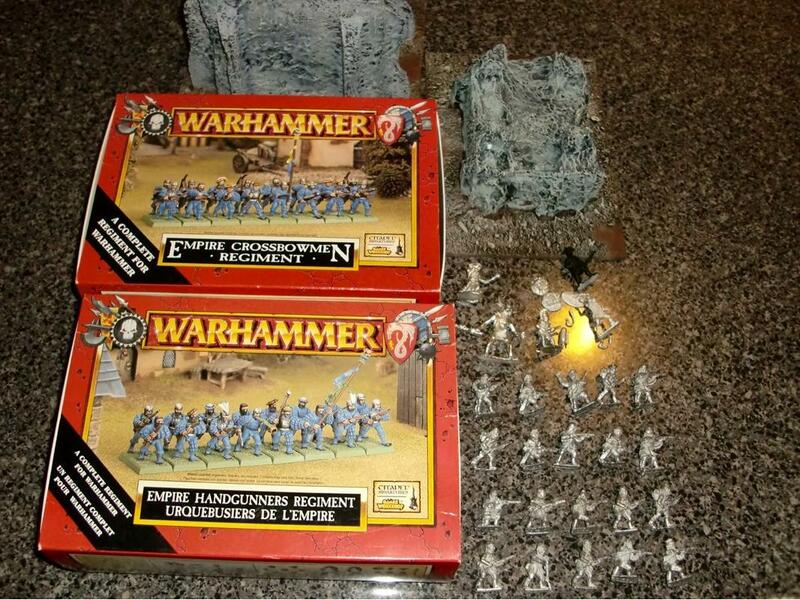 I'll also be picking up two more boxes of infantry from my buddy Pat. Each of the four boxes have 16 figures, so a total of 64 Core infantry. Should be up to about a 1,000 points with the addition of some other components - I definitely want a Steam Tank! Trumpeter Salute 2013 - Burnaby, B.C. Just got back from Vancouver, B.C. with my gaming buddy, Pat L. (aka Socal Warhammer). We attended the 40th Anniversary of Trumpeter Salute in Burnaby, B.C. It was the first time attending this convention for both of us. There wasn't as large a turn out as we had expected, but there were still a lot of nice games and the folks are very nice too. Mike Evans of Relic Miniatures stopped by on Friday night and took Pat and I to his old stomping grounds in Richmond and treated us to a fantastic Greek dinner. Pat, who is part Greek, and Mike spent the evening discussing the finer points of Greco-Roman/Hellenistic armament and tactics. I just enjoyed the lamb souvlaki and Greek beer. Here are just a few photos of the many games that were going on throughout the weekend. Let's Go Find That Gun by Wayne Johnson, Bolt Action. I participated in this game and got unusually great (for me) die rolls - stopping the advance of British Commandos who were trying to destroy the German guns. 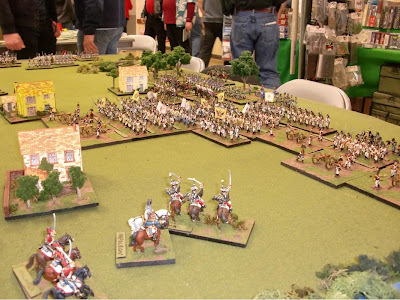 Battle of LaRothiere 1814 by Doug Hamm, General de Corps - there was a variety of 28mm figures used - from HaT 28mm and Old Glory 1st Ed. to Foundry, Perry and Victrix. They looked fine all together on the table. 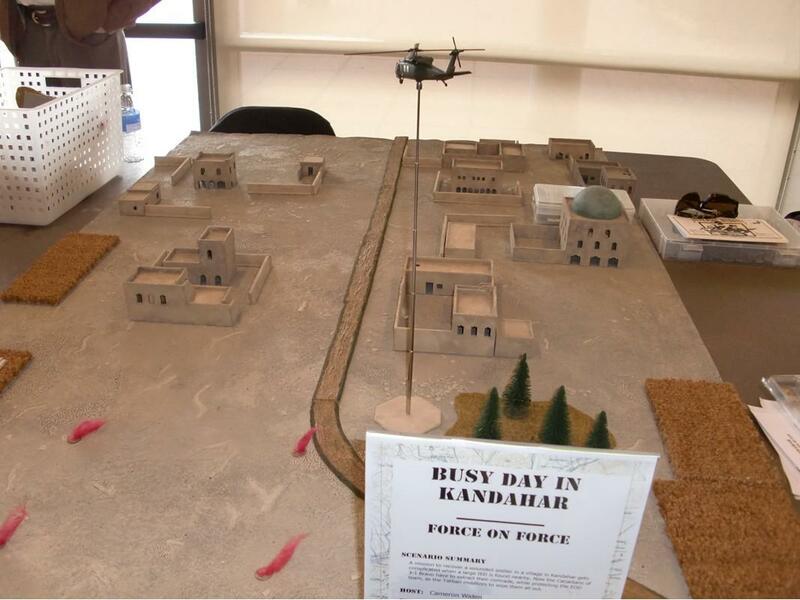 Busy Day in Kandahar by Cameron Widen, Force on Force. I was remiss to go back to his table and take more photos after the game started; but I was busy holding off the British and Canadians in the Bolt Action game I was playing in at the time. 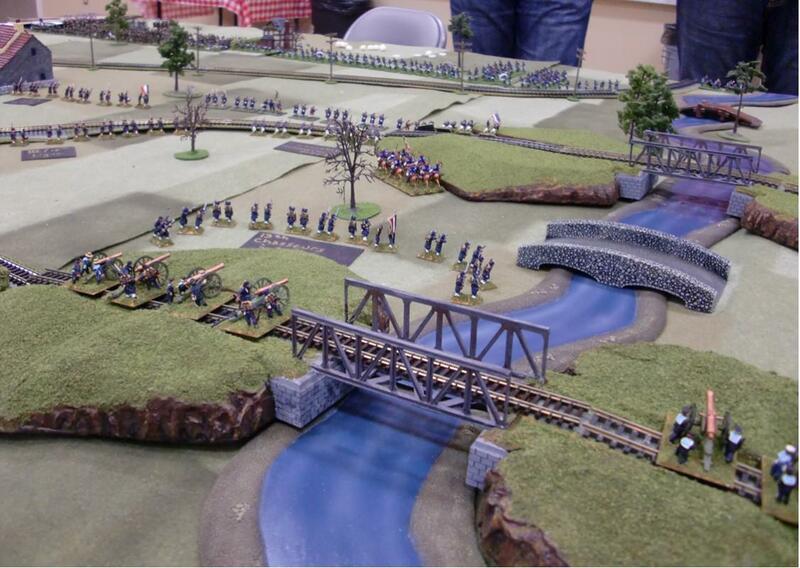 Hold that Line (FPW) by Pierre Stolte, They Died For Glory. 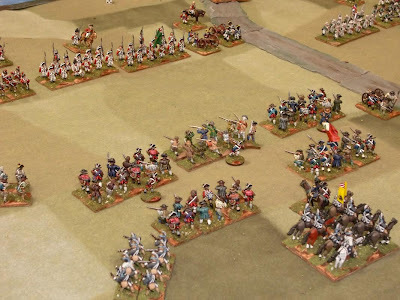 Battle of Mantinea by Dave Smith, Hail Caesar. My buddy Pat hung around this table providing solicited advice and opinions of the rules. This game too had a wide range of figures - from the newer plastic 28's to some very old, and OOP, stuff of slightly smaller proportions - but still grand looking on the table. Pirates, Pirates, Pirates! by Gord Colter & Bill Elliot, Savage Worlds Showdown- a fantastic looking game with beautiful models and terrain. It won Best of Period on Sunday. Even Whites Bleed Red by Brian Burger, Through the Mud and the Blood. 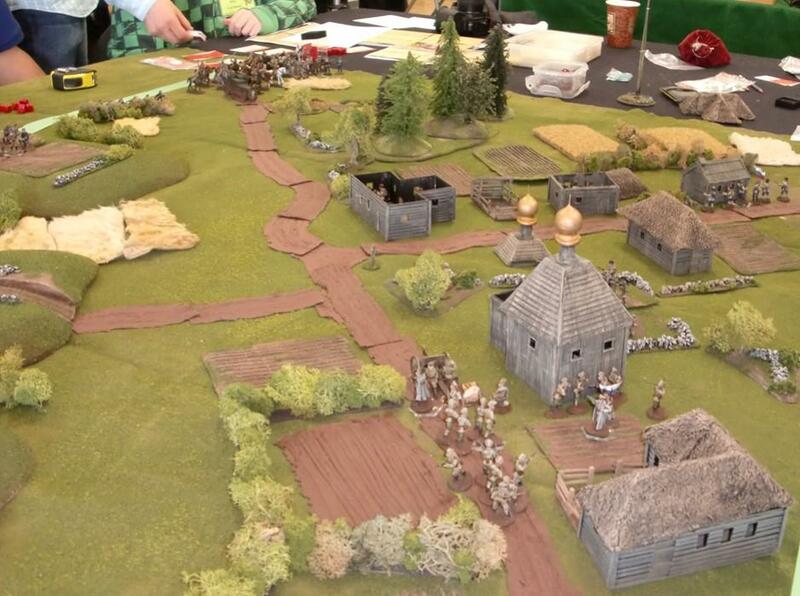 A cool looking game with aircraft, armored cars, trains and cossacks. There was a well-attended 40K tournament on Saturday, and also a Warhammer Fantasy Battles tournament on Sunday. Pat participated in the WFB tournament with his Vampire army. This was the first time I've ever seen either of these types of games played, being a historical guy. As it has been said, WAB is WFB without the magic - and so it indeed appears to be. I'm not into casting spells and such, but always admired the look of an Empire army - very Late-Medieval/Early-Rennassaince look. Fortuitously (or maybe not), I managed to pick up a couple of boxes of Empire infantry for a fraction of what they'd normally go for at the Bring and Buy. 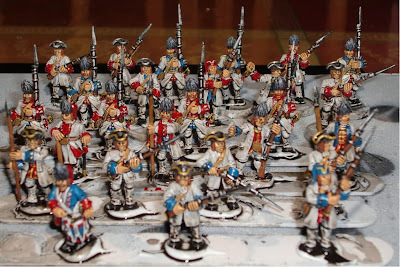 Speaking of the B&B, Doug Hamm (aka Larry Leadhead), who follows my blog (please check his out at Dots of Paint) saw I was interested in FIW and lugged about 5 pounds of Front Rank FIW lead for me. As I'm only doing skirmish he was shocked that I only cherry picked a handful of Rangers and coureur des bois - at .25 cents a piece! I even picked up some scratch-built terrain that someone was kind enough to mark for free at the Bring and Buy - I'll use them in my Bolt Action game next month. I hope I don't regret getting these Empire troops - please feel free to share your thoughts on this venture. Those are some Relic figures, including a Minotaur, above the Front Rank guys.